Tabletop design makes the FinishMaster 100 (FM100) portable and easy to set up. Our feeder design ensures consistent and true feeding throughout the job. The accessory holders, each individually adjustable, allow easy blade changes to minimize set-up time and effort. The anvil-style perforating provides a flat, burr-free finish capable of being fed through any subsequent finishing equipment with ease. 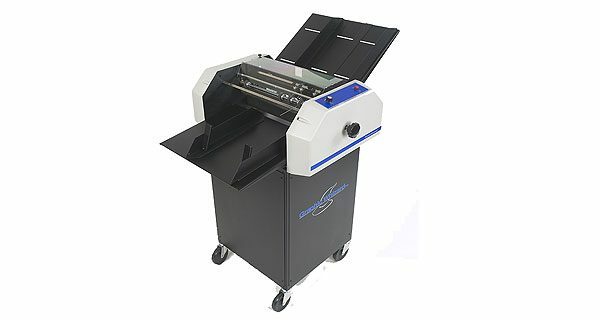 And with a maximum production rate of 10,000 sheets per hour, the “100” makes short work of your perf/score/slit needs. Don’t forget,the FinishMaster 100 can be upgraded at any time to the FM 150. From the floor model design with its 30 inch-long register board, to the conveyor outfeed delivery, everything about the FinishMaster 150 spells productivity. Operating at speeds up to 20,000 standard-size sheets per hour, the “150” is ideal for mid to long run finishing. Anvil-style perforation provides a burr-free flat finish. Blades can be changed in seconds, without removing any shafts. Production and value in one package.